KCBS reporter Matt Bigler recently visited the Castro Adobe to learn about the history of bull and bear fights at the property after recent archaeological work at the Castro Adobe unearthed what appeared to be the remains of a bull and bear fight pit. Times were very different during the Mexican Rancho period of the 1821-1850. The Spanish brought with them the tradition of bull fighting. The grizzly bear roamed freely in California at that time and skilled vaqueros (cowboys) would ride and capture a bear with their reata (lasso) and bring the captured animal back to where the fight was to be held. 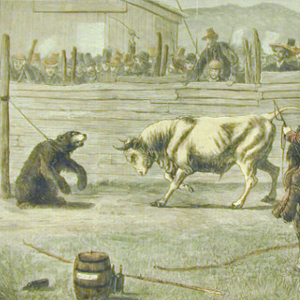 Prior to the mid-1860s, the spectacle of brutal bear and bull fights were enjoyed on the Sabbath after church services. Fights were held at Whisky Hill near Watsonville, in Santa Cruz at the junction of Branciforte Creek and San Lorenzo River (San Lorenzo Park) and at the Castro Adobe. Once at the Castro Adobe, bull and bear fights were held in the front of the adobe building, probably in a corral or designated fighting ring. Women and children would sit up on the balcony and watch while the men were closer to the action. When the two animals fought each other, people would bet on which one would survive or be killed. At the Castro Adobe, a reminder of the bull and bear fights was in place until the late 1950s when a hand wrought iron ring and tang was found inserted into a dying oak tree near the front of the building. It was used to tie up one of the animals during the fight. Times have changed at the Castro Adobe and bull and bear fighting today would be considered a crime. We can use historical accounts detailing the bull and bear fights to show us how much the culture (and animal rights) have changed since the late 1870s.